Here you must use your quite strange weapon and move using it! Well, it sounds strange? Then just do not waste your precious time and start the game right now. Are you ready for that? Then take your gun and go ahead! Everything is up to you now! Just aim the hose with your mouse. And try to move the firebot with WASD. So you always wanted to be a fire-fighter? Well now’s your chance! 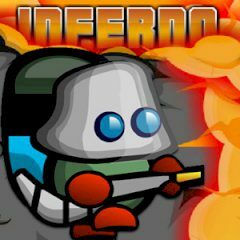 Just take on the role of a robotic fire-fighter and take on Infernos in various locations across town, from the bowling alley to the cinema to the gas-works. Use the arrow keys to move around, jump and climb ladders. Space to drop a sprinkler and mouse to aim your hose and spray the fire. Point your hose down and then spray and jump up to use your hose as a jetpack! So, just use all the skills and try to win the game!